A Really lovely unique piece, it is an original antique map not a modern reproduction so is over 115 years old! Original Soil map dated 1903. Grand Island, Nebraska. Wood River. Grand Island. ANTIQUE MAP. Stanton, Nebraska. Norfolk Junction. Original Soil map dated 1903. ANTIQUE MAP. PUBLICATION DATE 1905. ORIGINAL ANTIQUE MAP TAKEN FROM. Comprehensive cover is included up to the value of £41. 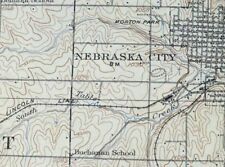 1907 NEBRASKA CITY NEBRASKA USGS TOPO MAP. USGS TOPOGRAPHIC MAP. 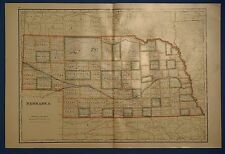 This sheet includes the only survey done by the United States Geological Survey for the Nebraska City 15-minute quadrangle. 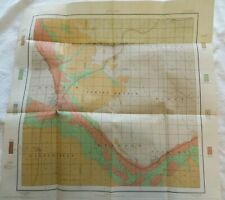 The map sheet is an original 1940 USGS print in good condition. This map is from the "STANDARD ATLAS OF DODGE COUNTY - NEBRASKA". Map of the State, United States and World. Compiled and published by George A. Ogle & Co., Publishers & Engravers, Chicago. I would be happy to include a copy if requested. AN ORIGINAL VICTORIAN MAP RESCUED FROM A DISBOUND ATLAS 1902. THIS IS AN ORIGINAL MAP AND OVER 100 YEARS OLD AND NOT A LATER REPRODUCTION. There will be another map on the reverse of the print. It is from the "STANDARD ATLAS OF DODGE COUNTY - NEBRASKA". Map of the State, United States and World. Compiled and published by George A. Ogle & Co., Publishers & Engravers, Chicago. Up for sale is a great, antique Illustrations Page (PORTRAITS) from a Nebraska Atlas. GOTHENBURG NEBRASKA USGS TOPO MAP 1902. This sheet includes the only survey done by the United States Geological Survey for the Gothenburg 30-minute quadrangle. 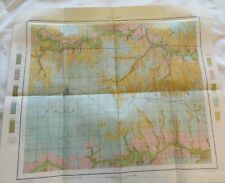 The map sheet is an original 1942 USGS print in very good condition. Presented is an authentic old map taken from a dis-bound plat book published in 1907. Map reverses to Weston. Presented is an authentic old map taken from a dis-bound plat book published in c.1904. Original hand color. Approximate Size is: 15 in X 17.50 in. It is from the "STANDARD ATLAS OF DODGE COUNTY - NEBRASKA". Map of the State, United States and World. Compiled and published by George A. Ogle & Co., Publishers & Engravers, Chicago. Up for sale is a great, antique Illustrations Page (PEOPLE) from a Nebraska Atlas. Presented is an authentic old map taken from a dis-bound plat book published in 1907. Map reverses to Rescue. 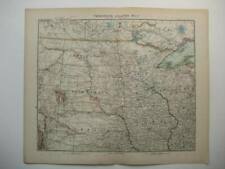 Up for sale is a nice antique map of the State of Kansas or Nebraska. Map was published in 1907 in the Universal Atlas of the World. On one side is a map of the State of Kansas. Overall map is in good condition. Presented is an authentic, old map taken from a dis-bound plat book published in 1903. Original hand color. Presented is an authentic old map taken from a dis-bound plat book published in 1903. Map reverses to Panama. Presented is an authentic old map taken from a dis-bound plat book published in 1906. Original hand color. Blank on the back side. Presented is an authentic old map taken from a dis-bound plat book published in 1903.